As #cranberryweek continues, I planned out my recipes for the week! I have already shared Easy Cranberry Orange Muffins and Slow Cooker Cranberry Pot Roast. As the week continues, today is a favorite dessert of my families! Today, I share my Apple Cranberry Crisp! I make a mean, not really mean, but if I may say, a delicious Apple Pie! Not that I want Apple Pie to take over this post, but many who eat my pie, tell me they don’t have the time to make a pie crust! Yes,I still consider them friends…I love making pie crust…that is a whole different subject. 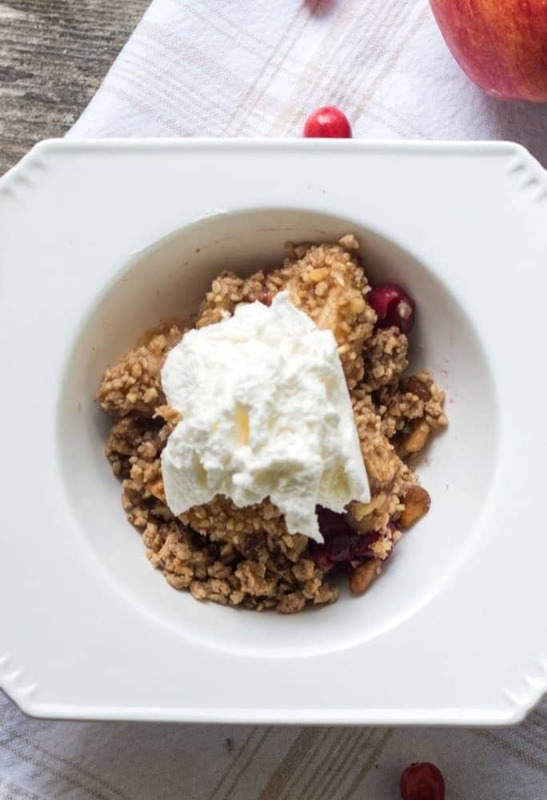 This brings me back to this amazing Apple Cranberry Crisp! 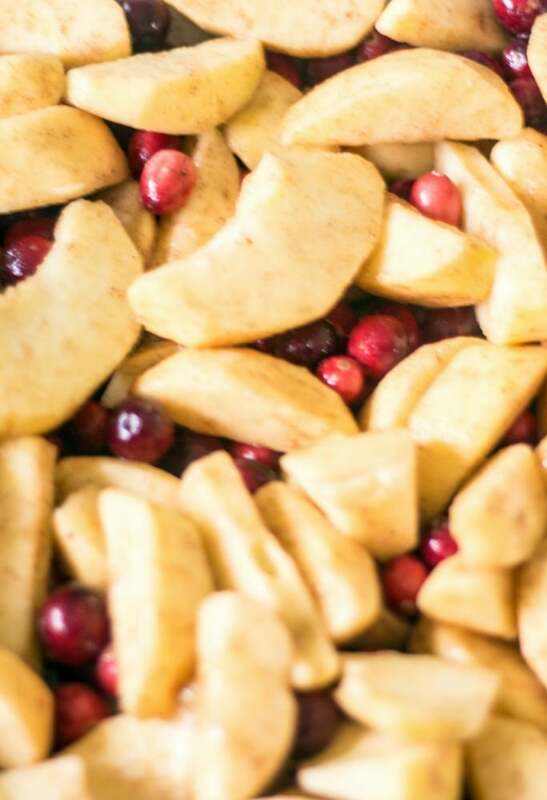 Fresh apples and cranberries make an amazing base for this crisp! Making a crisp is super easy and when making any meal, a fruit crisp is always an easy dessert! 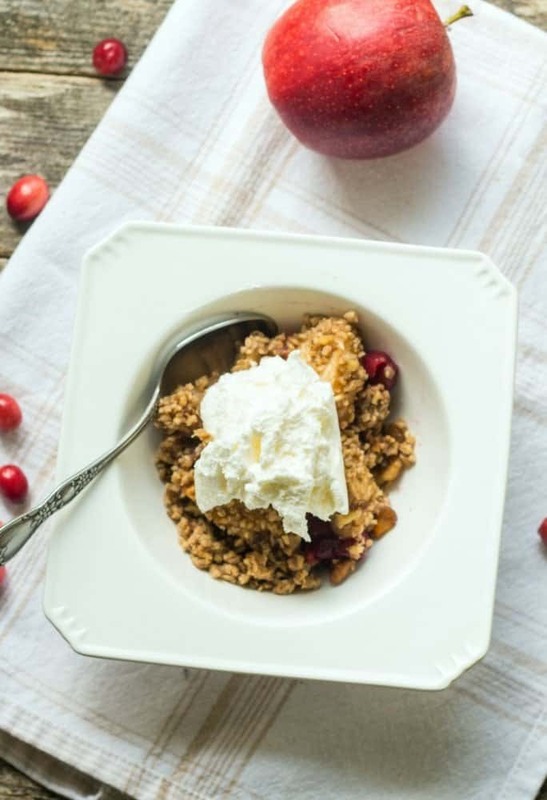 When Thanksgiving and Christmas come around, this Apple Cranberry Crisp is a perfect dessert to serve or bring to a family or Friendsgiving event! You get all the fabulous flavors of an apple pie but with little work! A perfect dessert for any night but for the Holidays, fabulous! All those flavors without a lot of work! cut the apples in 1 inch slices. This prevents mushy fruit as it cooks. You can swap out and use Gluten-free flour and the flavors are the same. Make ahead and cover with foil and serve the next day. I love that this crisp gives powerful flavors and I top with whip cream or vanilla ice cream and everyone is happy! So you don’t enjoy making pies and want the homemade feel, this is for you. You are a home cook and are over-burdebed with dishes, this is a quick fix homemade dessert that is always a crowd pleaser! An easy dessert that is a huge hit with family and friends. The combo of fresh apples and cranberries are fabulous together.Everyone will want the recipe. Preheat oven to 375 degrees. Have a 9 by 12 baking pan ready. In a large bow, combine and mix well, apples, cranberries, turbinado sugar, cornstarch, lemon juice, vanilla, cinnamon, nutmeg, and lemon zest. Pour these ingredients into the baking dish. In a medium bowl, stir oats, flour, walnuts, brown sugar, cinnamon and salt. Blend in the softened butter. The oat mixture should be a course mix. Sprinkle the oat/flour mix over all the fruit. Cover the baking dish with foil and bake about 35 minutes. Then remove foil, bake for another 5 minutes. to crisp the top and fruit will be soft. Remove from oven. Serve with either fresh vanilla ice cream or whip cream. Crisp can keep in the fridge, covered for about 4 days. I hope you pin this recipe to your favorite PINTEREST BOARD and follow me on PINTEREST! I’m always pinning from talented and amazing bloggers! I hope you enjoy making this tasty Slow Cooker Cranberry Pot Roast! I’d love to hear from you in the comments! Sign up for our newsletter to get weekly updates! I am so happy you enjoy the apple cranberry crisp Keri. 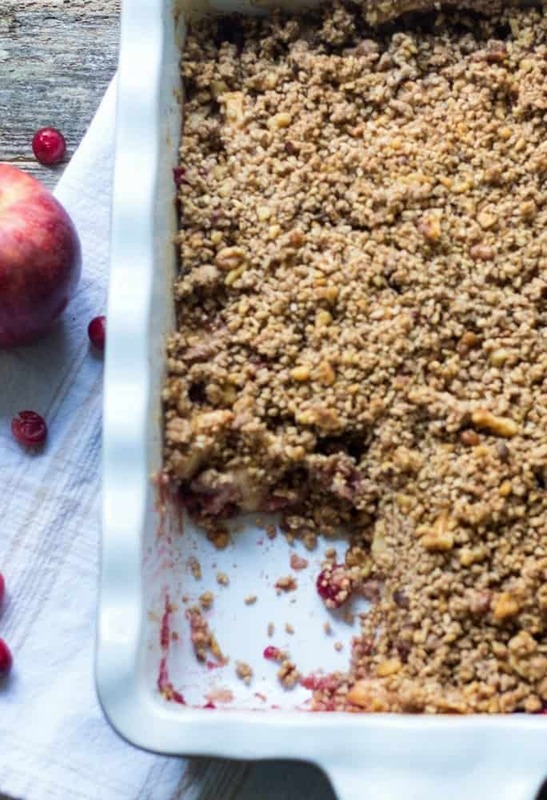 Love the addition of cranberries to this apple crisp. I think crisps are a perfect fall dessert.